Just got one of these phone from Argos today. Read more here from Binatone. I was sold on the device after watching this video on Youtube. The video, like cake, is a lie. So far as actually using this phone as a phone goes I have just used it to phone my beloved when she was sitting on the other side of the living room trying to watch the TV in peace. What you get is a cordless phone. 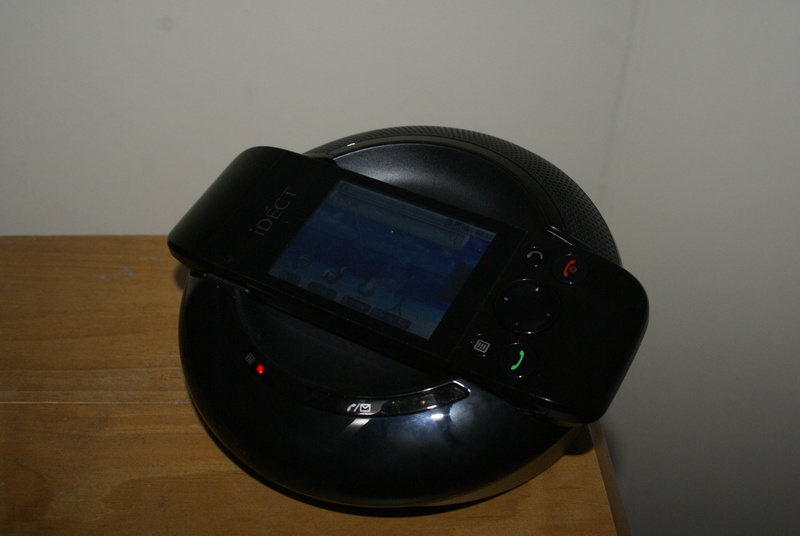 The base contains a digital answering machine with the ability to record 15 minutes worth of two minute max messages. Why that is in this day and age I have no idea. My cat with a post it note and a crayon would be a more effective message taker! As far as I can tell though the phone works well enough as a phone. A wee 320×240 pixel screen like your grandad had on his Casio Databank that seems to be as tough as old leather. A resistive screen so you will be thankful for the tiny stylus included in the handset until it is lost down the back of the sofa, or the throat of a small child. 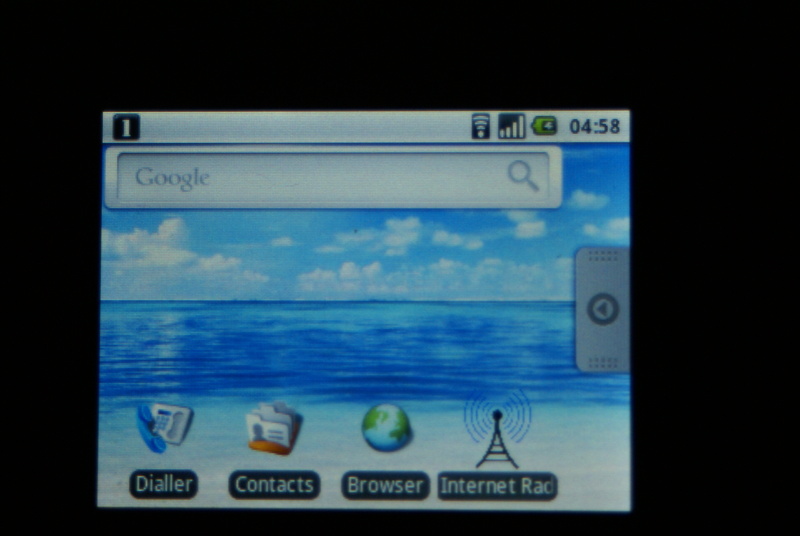 For basic stuff though the screen works well enough as a dial pad and for selecting contacts. The bas also acts as a speaker for music, Internet radio and handfree. It looks a little like a flying saucer. What it does not come with is a large 640×480 colour screen like my dream emailer would have done. Sorry about that. I loved the emailer. Loved it, loved it, loved it. It runs a modified version of Android 1.6. So no text messaging, the addition of some options for handsets and the answering machine. Also no official Google apps. So while you can add a gmail account to the email client you have to do it manually. For some reason when I was doing this I had to use imap.googlemail.com as the server instead of imap.gmail.com otherwise the security certificate would not be accepted. Everything else was as per instructions on Google. Contacts likewise can not be synced to a Google account and must be added manually. No vcard import and while I think it told me I could import from sim card as there is not a sim card slot this could be tricky. Market. No market. Not that I expected one, or indeed any official Google apps. But the YouTube video quite clearly shows some dodgy unofficial market software. The phone does allow sideloading of apps via the micro sd card but I have not tried this as yet as I have no idea which application are compatible with 1.6 anymore. I did try installing SlideME but it would not run. Not since I finally rooted my HTC Magic and installed Cyanogen, no thanks to Vodafone. Included in the default apps are a weather thingy, which did not accept my home town as a real location. An Internet radio app which seems to work fine. The stock web browser which works fine. If a little compressed on the tiny display. SOmething to do with Stocks. MP3 player, image viewer and so forth. An old version (5.2?) of fbreader which is pretty good if you want to read things on a tiny screen. Is it worth what it cost? Possibly not. Am I going to love as much as I would a large screen emailer? Probably yes. It is a gadget you can browse the internet on it, make phone calls and listen to music. It’s what mobile phones were five years ago. Once I have used it for a while and waited to see if anyone is going to release a market for it I will try to do a proper review. If you have any questions about the phone please leave a comment. Sorry for the bad formatting an unholy alignment between posterous and wordpress stuffed everything up.